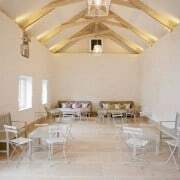 Finally, thanks to fab photographer Rosie Anderson, I have some lovely images of West Barn. We completed our second barn earlier this year to take the place of the marquee. It will act as a wet weather cover for drinks receptions, really useful for coffee and as we’ve put in some squishy sofas at one end, it’s also a perfect place for those who want to escape the music and just chill and chat. 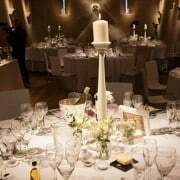 I was so pleased to see our tall white wooden candlesticks making their debut in the Barn at Will and Camille’s wedding on Saturday. Teamed with jam jars filled with simple white flowers, the overall effect was really stunning.